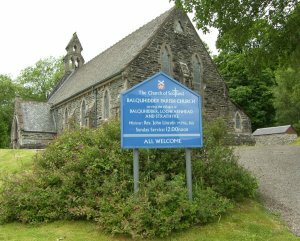 The present church of Balquhidder, shown above, was built on a new site to the north of the ancient graveyard, is of 19th century date. St Angus came to Balquhidder Glen in the 8th or 9th century and recognised what the Celts called a "thin place" where the boundary between Earth and Heaven was close. He knelt and blessed the glen at the spot where the house Beannach Aonghais, Gaelic " blessing of Angus ", now stands and built a stone oratory at Kirkton, where he spent the rest of his life. Angus may have possibly brought Christianity to Balquhidder. Behind the present church is Tom nan Angeae, the hill of fire, where until the 19th century hearth fires were renewed at Beltane and Samhain to encourage ancient gods to bring warmth to the land. Angus was buried at the foot of this hill and a flagstone laid over him which stands today in the present church. This stone, formerly in the floor of the medieval church, has a crudely incised figure of a priest holding a chalice. The carving is probably late medieval in date. Balquhidder was the scene of some of the exploits of Rob Roy, who died there in 1734. 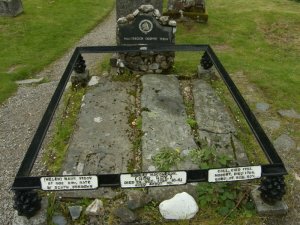 The local kirkyard is his final resting place, his grave marked with the appropriately defiant motto " MacGregor Despite Them ". He lies with the remains of his wife and two sons, the graves marked by three flat stones. 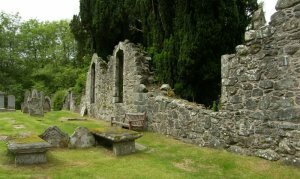 Some remains of the east end of the small medieval parish church of Balquhidder. 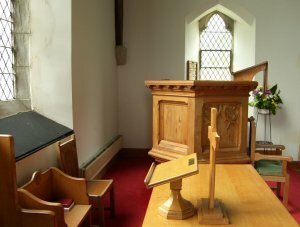 There is a display on the history of Balquhidder in the church, which is open to the public during the summer, when there is also a programme of evening concerts in the building.